T and A have been sharing a room for about two years now. When our sweet little man came, I would go in and find them sleeping together in T's room. They had their own rooms, but I guess they just wanted to be together. It makes me very happy that they wanted to share a room. I think its very sweet! They have completely different tastes and I had know idea how I was going to make it work. They both LOVE the beach (just like their mommy) and the ideas started flowing. First on my list was the colors. I love how gray and yellow look together. I found a beautiful gray from Benjamin Moore called Coventry Gray. I love it! Not too blue or green, just a really calm gray. 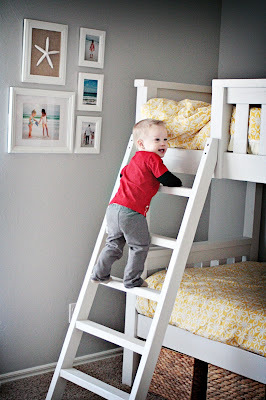 My awesome friend Seth made them the most BEAUTIFUL bunk beds ever! My sweet hubby painted them a few shades lighter then the Coventry Gray. I love how they turned out! Then, I found some really cute yellow and white comforters from Target. I also found some really sweet gray sheet sets there. 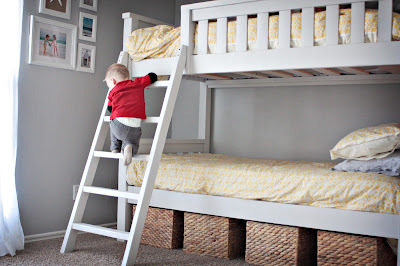 Then, I found some awesome milk crates from Target that fit perfectly under the beds. Oh how I love TARGET!!!! 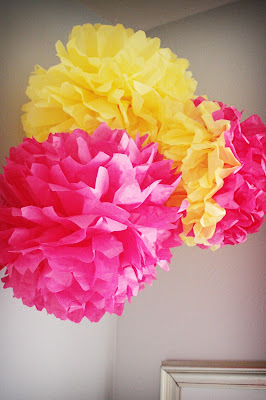 I made some hot pink and yellow flower balls that I hung up in the corner. The frames that I used were frames that I already had and I just painted them white and distressed them a bit. Everything I used on the walls are items that I already had and I just used them in different ways. I also printed out a 11x14 poster of a pic that I took of a daisy and I love how it turned out. The girls are loving their new room! It's so fresh and sweet. Here are some pics of their new room: PS: My little man wouldn't get out of my shot. Lol! AWESOME job with the decorating! Your girls will sleep sweetly in their new room!